One day last summer, when we were coming home from running errands, I pulled into the driveway and stopped to get the mail. As I walked up to the mailbox, I noticed that the post was about to fall over. I moved it back and forth, and suddenly it broke loose and I was holding it! Carrying the mailbox with post back to the van, I told the kids, "Okay, I got the mail!" We all had a good laugh. Obviously, it was time to replace the mailbox post. Today, I will show you how I accomplished the installation of a new post, keeping the cost under $40. To begin this project, you will need to purchase a new post. I purchased mine at the local home improvement store for around $35 plus tax. The new post kit I chose was steel with an adjustable-height mailbox bracket, and included a stake to hammer into the ground to which the post will be attached (see Figure 1). This was simple compared to other kids because no post-hole digging or concrete is necessary. Other advantages to this option is that it's lightweight and termites will stay away. Unless you really want a new mailbox, you can reuse the one you already have. 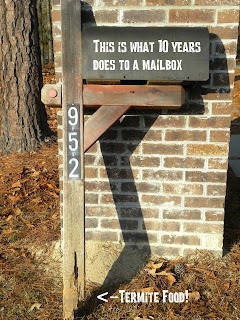 Remove your mailbox from the old post. Most likely, it will have a few screws keeping it in place. If it looks a little dull and dingy, a simple coat of spray paint will bring it back to life for about $2. Remove your old mailbox post. If it leaves a hole, fill it in with some dirt and pack it down. Also, remove the mailbox from the post, keeping the mounting brackets. Hammer the new post stake into the ground, making sure it is level, and install the vertical post (may be in two pieces depending on the kit). Place the new post in the same location as the previous post. Attach the mailbox mounting brackets to the post bracket (see Figure 2). Your mailbox may have a different hole pattern on the bottom, so attach them according to your needs. Place the post mounting bracket onto the post and tighten the screws. According to the US Postal Service, you should position the bracket so that the bottom of the mailbox is between 41"-45" from the ground. Set the mailbox into place and tighten the screws to secure it. If you want to update your mailbox with a fresh coat of spray paint, now is the time to do it. It is more convenient to paint it in place. Just be sure to cover the post and tape off the mailbox flag. Add your new address numbers to either the post or the mailbox. Be sure to have two sets -- one set for each side of the mailbox. Once you have installed your new mailbox post, you will be proud of the results. No need to spend money hiring someone to replace your mailbox post. You CAN do it yourself! I have received great traffic from this post from Hometalk and Pinterest users. A common theme in comments by readers is that they prefer the wooden mailbox post over the metal post. I agree with the idea of installing a more substantial mailbox post, HOWEVER, I want to encourage women specifically that they can do this project themselves without the need for special equipment, concrete, etc. This solution is very practical, with less hassle, and much less expensive than other options. To buy a mailbox post like the one mentioned in this blog post, click on the link below. Get free shipping with Amazon Prime. Looks good. Even if you mailbox has dents in it, if you work a tadge more, you can hammer them out before you spray paint it. Done it many times in the past for my previous property. Just curious how this is holding up since the post isn't set into concrete. Our ground is too hard to dig for a hole but I think we could pound in a post. Our mailbox is still standing and hasn't come loose. Now, it may be a little off level, but it has held up very well. We have hard, clay soil here, so it was a great cost-cutting solution. Please let me know if you do it, and please feel free to post pics on my Facebook page. I had forgotten I asked this question but just came across my bookmark for it. Yes, we put one in and it held up great, and is still standing as far as I know. We sold the house a year ago. We had clay soil and white rock a foot under it. It was quite the project to get it in.